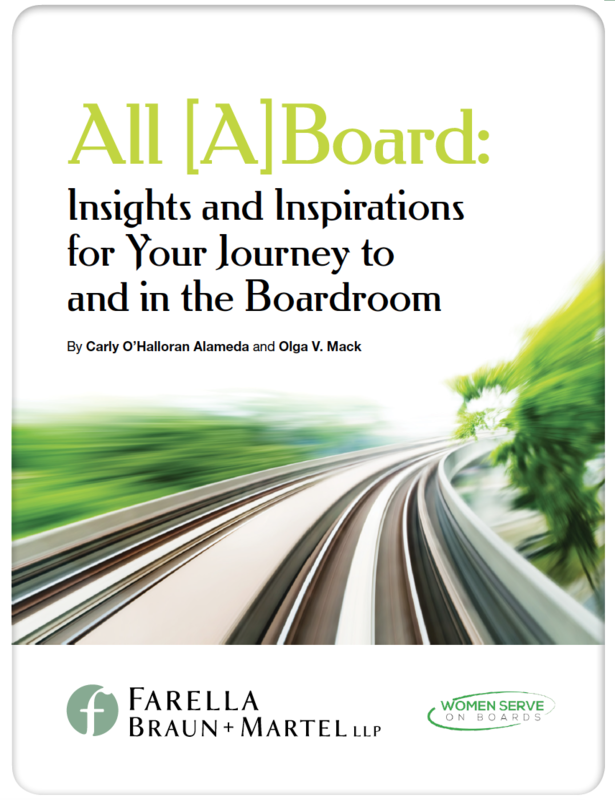 Women Serve on Boards is thrilled to announce the release of All [A]Board: Insights and Inspirations for Your Journey to and in the Boardroom in collaboration with Farella, Braun + Martel LLP. Olga Mack and Carly O’Halloran Alameda share their findings about the richness of board opportunities, the skills lawyers can bring to the board, the process for joining a board, and real life stories about lawyers serving on boards. (1) Pursuing a seat at the table: This section includes information on various corporate board opportunities and strategies for pursuing a board position. (2) Bringing value to the boardroom: This section includes insights on various substantive matters impacting board performance, including the board’s role with cybersecurity and company strategy, and ideas for diversifying the boardroom. (3) Inspiration from the boardroom: This section includes interviews of people who have successfully navigated the boardroom, who share their insights and experiences regarding their various boards, including corporate boards, non-profit boards, and family boards of advisors. Olga and Carly hope that these insights and stories are useful for others’ role in or path to the boardroom and they welcome any feedback, comments, stories, tips, or inspirations about lawyers’ path to and role in the boardroom.